Remember confliction in the marketplace is common and will cause you to buy when you should be selling and the reverse. This system seeks to calm the market movement by making showing signals as to the true direction of the market. I attach a screen shot with 3 situations to help you better understand. As you can see we have the 4 indicators loaded into 3 divided windows. First, we look to the indicators to see the overall color that indicates direction. >To the left of point (1) we see that the market is in an uptrend and has begun to flatten prior to point (1) we also see after point (1) that an extreme spike has formed in indicator (D) indicating a top maybe forming and we should begin to pay attention becaue a reversal in direction will be occuring. A small downward thrust does occur but we have conflict in the 4 indicators (A and B do not equal C and D) so no action should be taken. At point (2) we clearly see all 4 indicators showing a top had formed and at that point (2) a SELL order initiated at the CLOSE of the candelstick. We then see price drop. We watch the market progress until a corresponding bottoming extreme spike occurs indicating a Bottom maybe taking place. At the close of the bottoming spike candlestick, one would exit the order taking profit. At point (3) we see a signal change the 4 indicators with ABCD showing up. At the close of this candlestick a BUY order would be initiated. We would then let the market run intil a exiting extreme spike forms indicating a new top is forming. This system can function in any currency pair and in any timeframe. As a matter of preference and reliability I prefer the higher timeframes as the change will occur faster in the lower timeframes and the indicator tend to repaint the lower the timeframe making it harder to keep track. But once all 4 are the same they do not repaint.Again, make no moves until all 4 indicators are pointing in the same direction. When they do show agreement.....ACT with no hesitation. I think you will find you increase your sucess in the market. Proper Money Management skills are essential to becoming good and successful currency trader. Money management is by far the most important skill to master if you want to become successful at trading FOREX. Money management is simply a system you incorporate that will effectively preserve capital while you increase your profits. In other words a good system will help keep you from losing all of your money and help you make money. It is important to maintain a proper account ratio system (ARS) based on the size of your total account balance. This is to ensure that your account does not get overextended and one suffers significant account losses or even a margin call on account causing one to lose all tradable capital in account. To properly do this one need to establish a ratio system based on the 10-1 ratio rule. ARS basically states that for every 1000 in an account will be equal to one trade lot allowance of 0.10 lot. Therefore the maximum total trades for a 1000 account would be 0.10 lot(s). Based on this system you would maintain the following ratios. However, this does not mean that one is only allowed to trade one order at a time. This system simply stated that the MAXIUMUM open orders do not exceed the ARS system ratios. So, if one had 5k in account the maximum number of mini lots cannot exceed the 0.50 ARS total. Orders could be organized in any combination desired. (3) 0.10 lots and (1) 0.20 lot…. (2)0.20 lots and (1) 0.10 lot…. (1)0.20 lot and (1) 0.30 lot…. Why do this? Because it will help you to preserve your account in-case of order loss and provide you with the comfort to know that even though you may take a StopLoss hit you will not be over leverages and lose your whole account through a margin call. But the level of risk you wish to use is simply up to you. Using the ARS ration system will make one less nervous and more inclined to jump into an order than hesitate and lose position when the strategy system signals one to execute an order immediately. The entry and exit strategy is simple. For placing an order one would wait until you have an extreme spike and the other 3 indicators show the same colour in the direction of the extreme spike. This is shown in the graph as position (A). To exit your order you let the market price action run its path until ,on the closing candlestick, there is an opposite extreme spike (spike with colour) that indicates a top or bottom extreme point has been reached. This is represented in the graph as position (B). For this system, I recommend practicing a very conservative order protection loss system. Once an order is executed, immediately assign the order a 50pip stoploss. If the market turns against you, you will only loose a small amount versus if there is no stoploss and it the market move is heavily against you if can be very costly with no stoploss. The key is to protect your orders placed as much as possible in effort to minimize losses and maximize gains. Therefore, once the pip count exceeds 30pips positive (market moves 30pips in your favor), move the stoploss to 3pips in front of the order to protect from having any loss on the trade. This will ensure you have atleast a 3 pip profit if there is a sudden change in market conditions. Yes, in whipsaw action one may get stopped out more often but in those cases it usually means the market is not ready to move in the direction of your order and you can wait on new pricing action that normally means a second entry order that is at a better price than the first because the market was simply not ready. The system exit strategy is simple but here are three possible degrees of exit based on ones level of conservativeness or aggressiveness. When the Cycle indicator shows an extreme spike (spike with colour) exit the trade at the close of that candlestick. This strategy makes sure that you get all the profit from a trade as the extreme points are reached in a movement. The downside to this strategy is you are exiting an order based on just one of the indicators which is the one that is prone to repaint. If the price action movement is stronger that the cycle extreme shows one would be exiting potentially at the first beginnings of a strong movement and will miss out of the entire movement. When the Cycle indicator shows an extreme spike (spike with colour) exit one half of the trade at the close of that candlestick. This strategy makes sure that you get half of the profit from a trade as the extreme points are reached in a movement. The second half of the order would continue to run until the trendline changes colour. Once the trendline changed colour one would exit at the close of that candlestick. With this strategy half of your order has the potential to gain further if the price action movement is stronger than the extreme point indicated and you could reap the extra movement pips. The downside is that if the extreme is on target and rebounds could hit your 3 pip positive stoploss and loose half your profit. When the Cycle indicator shows an extreme spike (spike with colour) one would not exit the order and look to a second indicator (trendline) for the exit signal. Once the trendline colour changes, one would immediately exit the order at the close of that candlestick. 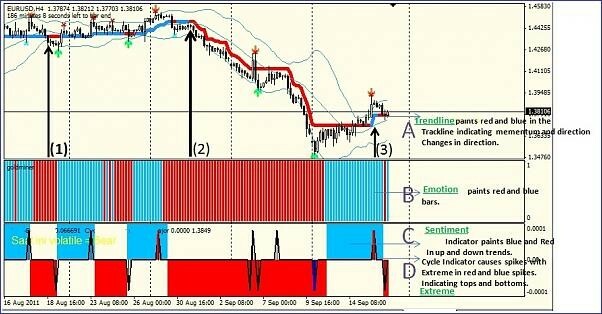 With this strategy you have the potential for further gains if the price action movement is stronger than the extreme point indicated and you could reap all extra movement pips with a full order. The downside is that if the extreme is on target and rebounds the price action could hit your 3 pip positive stoploss and one would lose your potential profit. SPECIAL EXCEPTION to Exit Strategy This exception applies to all Exit Strategies and supersedes them. When a trade produces an Extreme Spikes before reaching 30 pips....that is a WARNING that the initial movement is insufficiently strong to continue in its current direction. It is telling you that the price action is going to reverse. That is a hard STOP signal for one to ,EXIT THE TRADE IMMEDIATELY, or one will end up with losing trade. Again, this is a very important signal because the market is in the process of reversing the price action movement.